With Amazon Kindle Unlimited, there are no time limitations, due dates or loan expirations. You won’t see books that are unavailable because too many copies are already checked out. Plus, the service isn’t limited to just old or poorly rated books. Kindle Unlimited offers many thousands of books in every category, including best sellers, so you’re never at a loss for reading material. I’ve subscribed to Kindle Unlimited almost since its inception, checking out books for myself and my kids. My older daughter was plowing through books so quickly that I had trouble keeping her in reading material. I was thrilled with the number of books I could find for her and for myself. Amazon offers hundreds of thousands of books through Kindle Unlimited, with access through Kindle apps plus audio book recordings through Whispersync for Voice. To get started with Kindle Unlimited, click here for an Amazon Kindle Unlimited 30-Day free trial . You’ll need to have an Amazon.com account with a valid credit card on file and one-click payments enabled in order to use Kindle Unlimited. If you decide you don’t want to continue your subscription, cancel during the initial 30 days to avoid being charged $9.99 per month going forward. After you sign up, you’ll want to get the Amazon.com free Kindle Reading App available for most devices , including your Android phone, Android tablet, iPad, iPhone and computer. Launch the app on your device and login using your Amazon credentials, then go back to your web browser and login to Amazon.com again. On the top left, click Departments, then select Kindle E-Readers and Books, then Kindle Unlimited. Scroll down the page to see Kindle book recommendations in various categories. You can choose a book this way, or keep scrolling until you see the full category choices. In addition, you can search for Kindle books by name or author using the same search box you use to find anything else on Amazon. 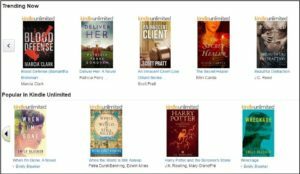 Kindle books listed in your search results will show a Kindle Unlimited logo to let you know you can read them for free with your subscription. 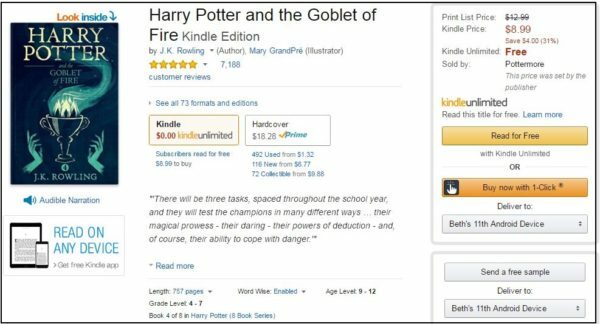 If you’re looking for kids’ books, you’ll find the complete Harry Potter series, plus plenty of Minecraft fan fiction and even how-to books on drawing, origami and more. Kindle books for younger kids include popular series themes such as Bubble Guppies and Team Umizoomi. Some books on the Kindle bestseller list for grown-ups are also available through Amazon Unlimited, including The House By the Lake by Ella Carey, Doing It Over by Catherine Bybee, Where Love has Gone by Harold Robbins, When I’m Gone by Emily Bleeker and Deliver Her by Patricia Perry Donovan. You can find Mary Higgins Clark’s As Time Goes By, plus the famous Hunger Games books. My daughter loves What If by Randall Munroe and won’t let me return it. I’ve had it checked out for almost a year. When you find a book that interests you, click on it, and look on the right where you can choose your mobile device from the drop down (if you use more than one, such as a tablet and a smartphone), and click Read for Free. What I normally do is choose the Send a Sample option instead. The sample is long enough for me to decide whether I like the book and want to keep reading, in which case, it’s easy to download and read the rest of the book through the Kindle app. It also lets me download a lot of potential reading material at a time, since there doesn’t seem to be a limit on how many samples you can choose. 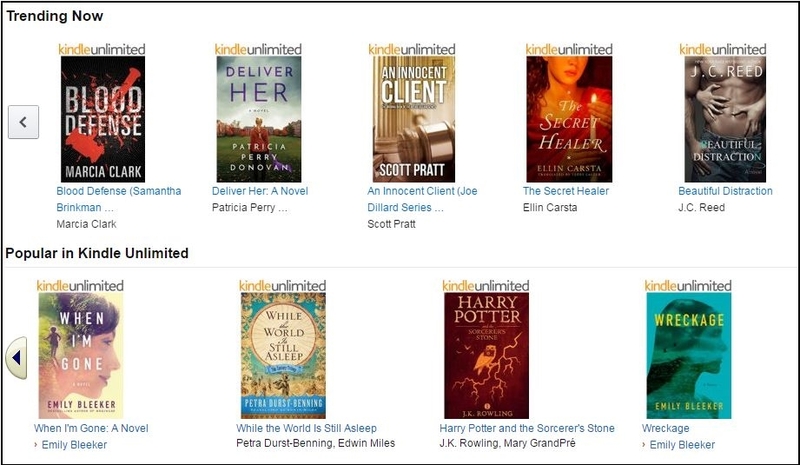 There’s a limit of 10 Kindle Unlimited checkouts at a time. As with books that you purchase, your borrowed Kindle books will appear in the carousel of every Kindle app you have installed and registered with your Amazon account. 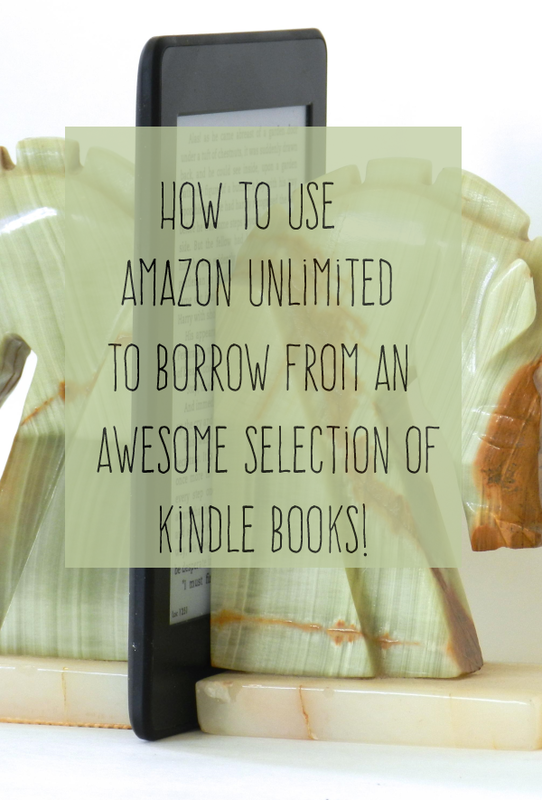 There are two main ways of returning books loaned through Kindle Unlimited. You can go to Amazon.com, mouseover Your Account in the top right, then choose Manage Your Content and Devices. Then, click on the three dots to the left of the book you wish to return and select Return This Book. Another way to return a book is to wait until you’ve exhausted all 10 of your loans and try to borrow another title. You’ll be prompted to return the oldest book in your queue. You can click Return Another Book to choose any one of the 10 books you wish to return, so you can check out another title. What do you think of Kindle Unlimited? What’s your usual way of getting books – Kindle or regular books, borrowed or bought new or used?